For many years, a tar and gravel roofing system was the only option if you had a flat roof in need of covering. This roofing system was based, like many things in our economy, on the cheap availability of crude oil. It was cheap and effective, and so it has maintained its place in the spectrum of flat roofing options. Several layers of asphalt sheets get applied to the roof – usually three to five sheets – using hot tar and applied along with roofing felt. Then a layer of bitumen and mineral coating is added to the top. Finally, a layer of gravel is applied to weigh down the roofing materials underneath and to protect against sun damage. The gravel also acts to reflect some of the sun’s light away from the building. However, with the new applications available in commercial roofing, tar and gravel isn’t the first choice for many experienced commercial roofers for several good reasons. Now, although we have experience working with tar and gravel roofing, we often recommend membrane or single-ply roofing systems instead. Not only are they more efficient, but they come with other benefits both to our customers and to us. One of the drawbacks of tar is that it starts to crack over time and with exposure to the elements. As it ages, it gets more brittle. As you will imagine, a cracking surface result in leaks. The gravel sitting on top of a tar roof complicates matters because it covers the surface. This makes cracks harder to see. In addition, since water can travel a long distance from its originating point, it can be almost impossible to find the break on the roof from where a leak is on the inside. Tight budgets sometimes mean that owners cut corners on roofing materials. While a tar and gravel roof can last between 20 and 30 years, not every tar and gravel roof will last this long. The lifespan of any roof depends upon the quality of materials and workmanship involved in its installation and on the regularity of maintenance over its lifespan. Membrane roofing can last for 20 years, and it’s also an economical solution for your commercial roof. Membrane roofing systems are much lighter because they are much less dense. You can get the same or better waterproofing for a fraction of the weight. Tar and gravel applications rely on a hot kettle of tar. It’s hazardous because of its heat and propensity for spill accidents or explosions which have caused fatalities in the roofing industry. It also emits noxious fumes. For these reasons, it’s more expensive to be insured to apply tar and gravel roofing. Single-ply membrane commercial roofing comes in white, unlike anything having to do with crude oil. A white roof is one of the best ways to combat high energy bills in the summer months, as it reflects away the sun’s warmth better than gravel. In a membrane system, a thick layer of insulation board is also applied, adding that much more energy efficiency to your building. 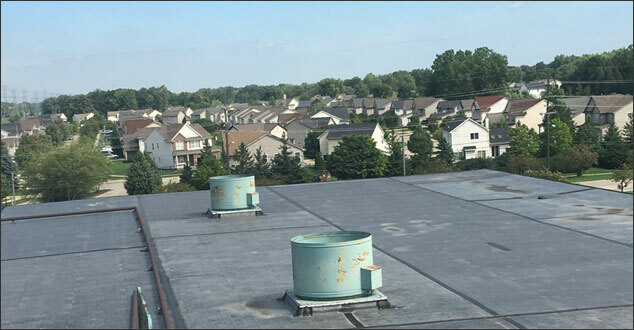 Whether you are looking at an expensive replacement of your current commercial roofing system or trying to get on track with a maintenance plan that will keep your existing roof in top shape, we’re here to help you in the Southeast Michigan area.